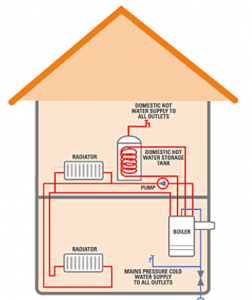 What is a system boiler and how does it work? This design is generally fitted for central heating systems which are “sealed circuits” where the all the plumbing work connecting to cylinders is “closed”. The fact that the water flow circuit is sealed, and not open to the surrounding atmosphere, maintains water pressure and so, combined with the fact that most of the important elements already built into the boiler, takes away the requirement for an expansion tank & feed system. However, in some cases where the hot water cylinder is not pressurised they may require a tank for cold water. 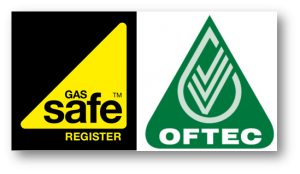 The operating method is opposite to that of a Combi Boiler in that it makes use of storing water then heating it, rather than using the mains flow and heating the water as it comes into the home. Really advantageous for larger families, this design is comparatively less complex to install due to many of the “workings” such as the pump & safety valves etc. being built-in, meaning less materials, which can also help keep down the cost of maintenance. However, compared to a combi, they do use a bit more room as you will need to have the hot water tank stored in a cupboard (usually the airing cupboard), but that is offset somewhat by not needing the extra tanks in the loft. Get the largest storage cylinder that you can fit, so you have a good reserve of hot water, but make sure it is really well insulated and then you can enjoy constant hot water to as many taps or showers as you like without suffering any pressure drop.